Bgo was known for its bingo games, but switched to its new platform back in 2012, offering a selection of casino games along with its core bingo offering. 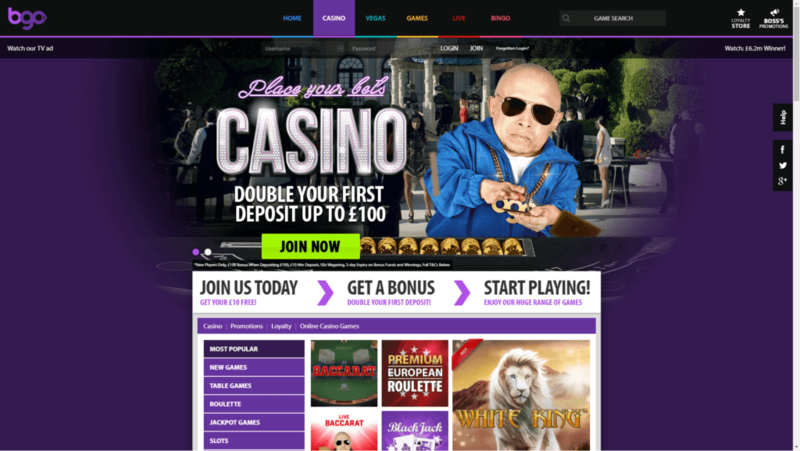 As a relatively new casino site, it feels designed with a modern casino gamer in mind, and is easy to navigate, while the unusual name – a reference to its bingo reputation – is fun and easy to remember. One of Bgo’s strengths is its range of casino games. Instead of relying on just one gaming software provider, it uses software from a number of different companies – so for example, you can play slots from NetEnt such as Starburst and offerings from Microgaming and IGT, as well as games unique to Bgo. Combined with the fun and easy to use layout, this makes for an enticing and attractive package. 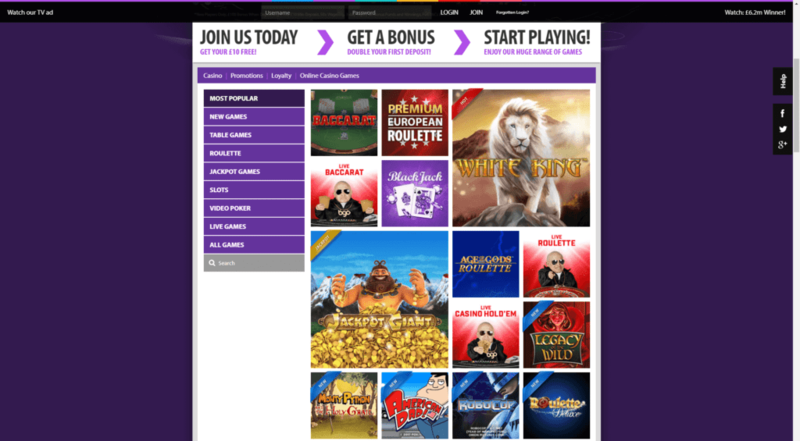 With so many casino sites trying to attract new customers with deposit bonus and no deposit bonus offers, it’s rare to find a welcome bonus package that stands out, but Bgo certainly score in this area. Their welcome bonus of 10 free spins on registration and mobile verification, no wagering – is attractive and easy to claim. Best of all, if you play bingo at Bgo, for every £10 that you deposit on your 1st deposit, you will get 100 Candy Club Points. Just use the code “BINGO”. You can cash in your Candy Club points to buy bingo tickets, or even take a spin on a range of mini slots located in any of the Bingo rooms or in the Bingo lobby. That’s an excellent bingo bonus compared to Bgo’s rivals and any bingo players out there who haven’t taken advantage of this bonus should certainly consider it. Bgo also offers a five-level loyalty rewards program which compares well with rival sites. New players are automatically entered at Blue level and you can work your way up through Bronze, Silver, Gold, and Platinum levels. Regular players will earn loyalty points that can be redeemed for cash – a nice touch from a company that clearly values player loyalty. Bingo is still the heart of the Bgo gaming experience, but the site also offers an impressive range of casino games. The total of 150 casino titles doesn’t compare with some of the bigger sites, which can offer in excess of 500, but what Bgo lack in numbers, they make up for in variety, sourcing titles from a range of providers and packing a lot of choice into their site, including some of the best slots online. All of the most popular table games are featured and listed under the ‘Casino’ section, while its slots titles – including the ever popular Starburst – are found in the ‘Vegas’ areas of the site. There is a particularly eye-catching selection of blackjack variations, including single deck, Double Exposure, Hot Streak and Pontoon, available in advanced and high limit versions, while the live dealer casino games, enabling you to play live blackjack or roulette, are a pleasant surprise for a small site. As you would expect from a modern online casino, Bgo’s customer support is available 24/7. While there is no direct phone support, there is an email facility and a live chat option, which is particularly useful and convenient. For instance, I had a question about how the welcome bonus operates and I was able to resolve it within minutes via live chat thanks to the helpful response of a Bgo customer service operator. As one of the newest online casinos on the block, Bgo is fully adapted to the demands of the modern gamer and mobile gaming has been fully integrated into their offering. All major platforms including Android and iOS are supported, along with all devices, and unlike some of its competitors, Bgo offers compatibility with Blackberry. All the Bgo games run smoothly on mobile devices, which makes playing on the go easy and enjoyable. Bgo may not suit hardened slots players looking to play the latest progressive slots or win a life-changing jackpot, and the fact that the site only works with the GBP currency may also be a barrier for international players. But it is likely to appeal to the bulk of casino gamers, along with bingo fans, while newcomers will be reassured by the fact that the site is licensed by the Alderney Gaming Commission – which has a reputation for strictness. So if you’re looking for a secure site that offers a modern gaming experience, attractive bonuses, fast and responsive customer service and exemplary mobile compatibility, there aren’t too many sites out there that perform better than Bgo. It’s a top UK online casino and I rate it as a 9/10.